Carte du Congo et du Pays des Cafres. 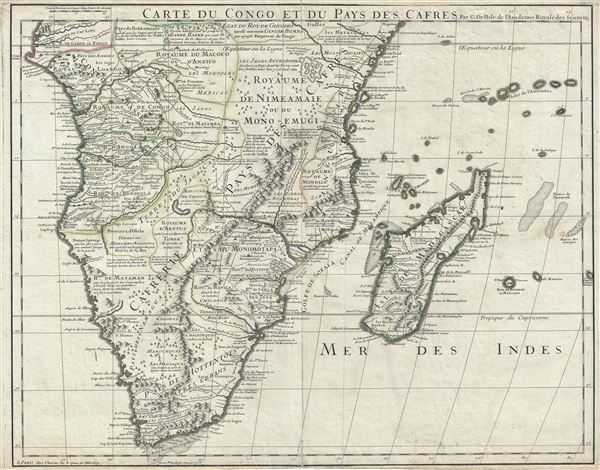 This is an extraordinary example of Guillaume De L'isle's 1708 important map of Africa south of the Equator. It depicts southern Africa in stunning detail with numerous notations and comments regarding the people, geography, and wildlife of the region. De L'isle was a very cautious and scientific cartographer, basing his maps on the first hand reports from sailors, merchants and missionaries that, at the time, were flowing into Paris at an unprecedented rate. This map offers significant detail throughout the interior naming numerous tribal areas and kingdoms including the Jaga, the Kongo, the Angola, the Kingdom of Numeamaie or Mono-Emugi, Monomotapa, Gingiro, and others. The Kingdom of Gingiro is known from the reports of the Jesuit Anton-Fernandez who traveled to the region in 1613 on a mission for King Philip II of Spain. Anton-Fernandez offer a wealth of detail about the Kingdom nothing that Gingiro means 'monkey' in the local language and that the king himself a kind of monkey-God. One hundred years later, when De L'isle drew this map, Anton-Fernandez's journal remained one of the few reports of this region available and, for want more up to date information, was incorporated. Most other regions of Africa rely on equal vagarious references. Shows the Portuguese trading colonies of Sena and Tete (Santiago) on the Zambezi River. Also near the Zambezi, 'La Victoire Couvent de Dominicains' is worth of mention. Also notes the predominantly Arab island kingdoms of Pemba and Zanzibar. Identifies the Dutch colonies near the Cape of Good Hope, including 'Fort Hollandois' (Cape Town). Near the Equator, De L'isle identifies an enormous lake almost exactly in the modern location and form of Lake Victoria. He notes that this is a 'Grand Lac place sur le raport des Negres.' What is remarkable about this is not the appearance of a lake in this region, one of the two Ptolemaic sources of the Nile appeared on maps of this area for hundreds of years, but rather that it seems to be based on actual evidence and it is not connected to any of the great African river systems. It seems highly likely that this is one of the first clear references to Lake Victoria to appear on a map. This map was created by Guillaume De L'isle in 1708. Very good. Minor wear and verso reinforcement along original centerfold. Minor offsetting and foxing. Original platemark visible.